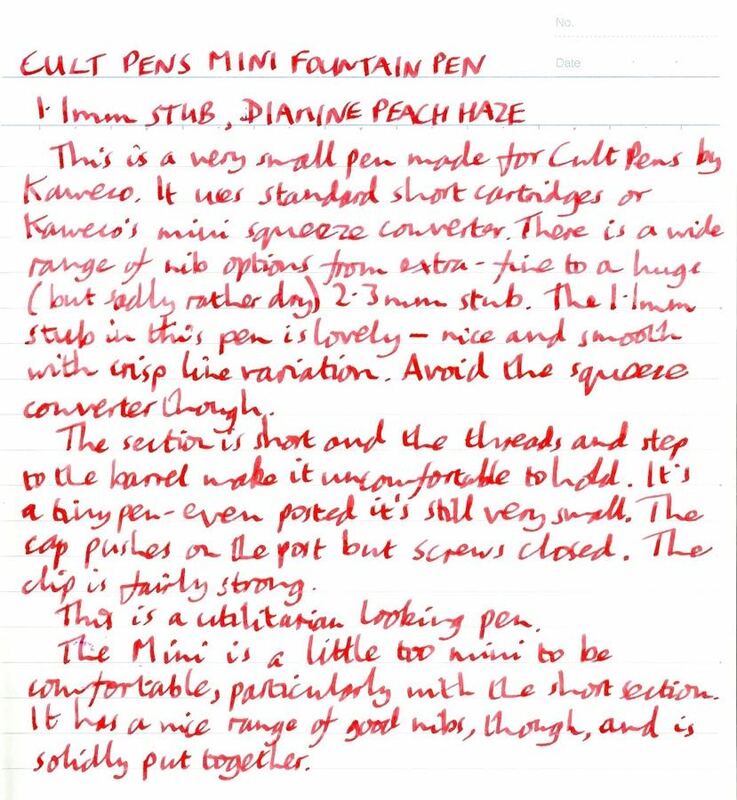 Cult Pens Mini Fountain Pen Review – Pens! Paper! Pencils! Cult Pens are building up quite a range of products. 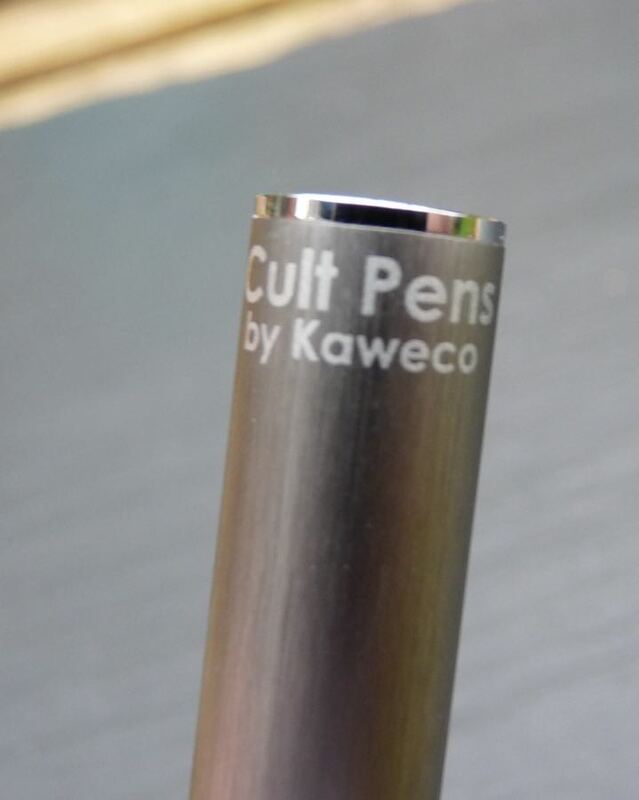 I reviewed their mechanical pencil recently and now it’s the turn of their pocket fountain pen, made for Cult Pens by Kaweco. Thank you to Cult Pens for sending me this pen in exchange for an honest review. These are my own opinions. 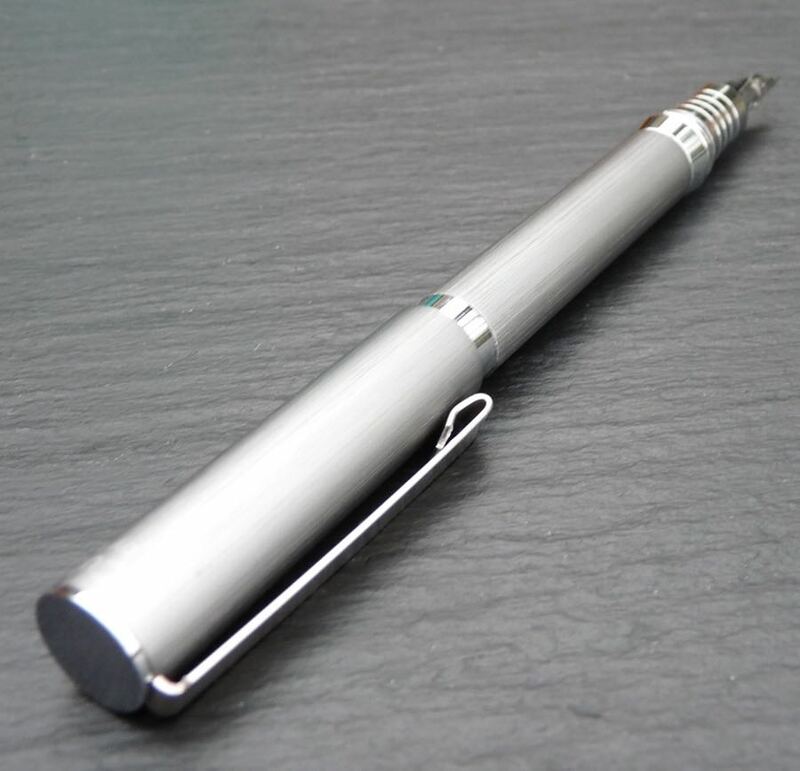 The Mini Fountain Pen is made from aluminium and this one is anodised in grey. It looks very utilitarian and not a little 70s. The clip is a simple folded metal affair. It works as advertised but is maybe a little too plain. 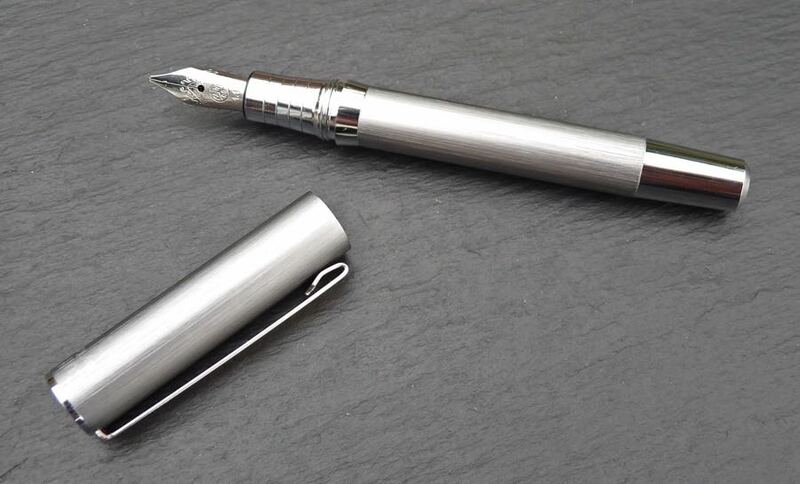 This pen is available with any of Kaweco’s steel nibs. I picked the 1.1mm stub and it’s a great nib. Kaweco have had some issues with their broader nibs in the past, with the feed not always being able to keep up. I’ve now tried two of the 1.1mm stubs and they’ve both been great. They’re smooth and give a good crisp line variation. There’s an occasional hard start on glossy paper but that’s the only problem. The 1.5mm stub is probably okay too but be careful with the 1.9mm and 2.3mm: they can struggle a little unless you write very slowly. 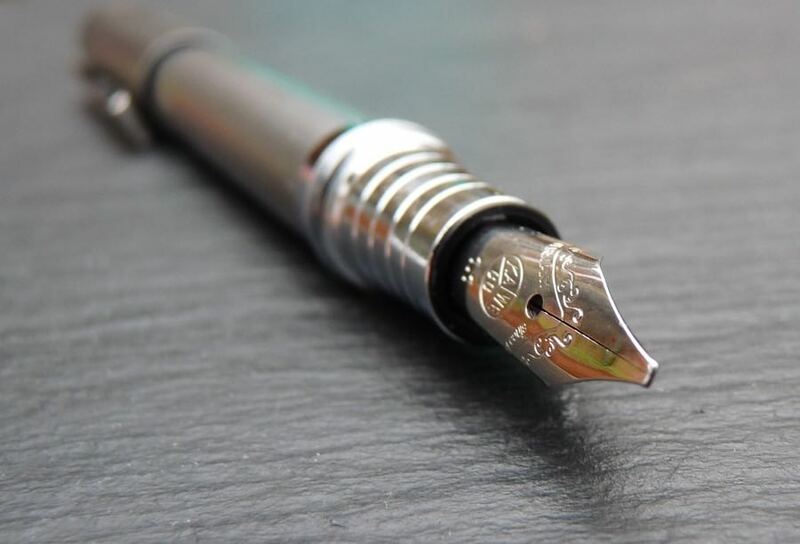 If you prefer a finer nib then Kaweco’s fine and extra-fine are amongst the best steel nibs going. It’s a small pen so of course there’s not much room for a converter in there. Kaweco’s mini squeeze converter will fit but don’t bother, it’s terrible. (I used it for this review but, really, it’s more trouble than it’s worth.) Use cartridges instead: being the standard size, there’s a huge selection (and you can always refill, using a syringe). 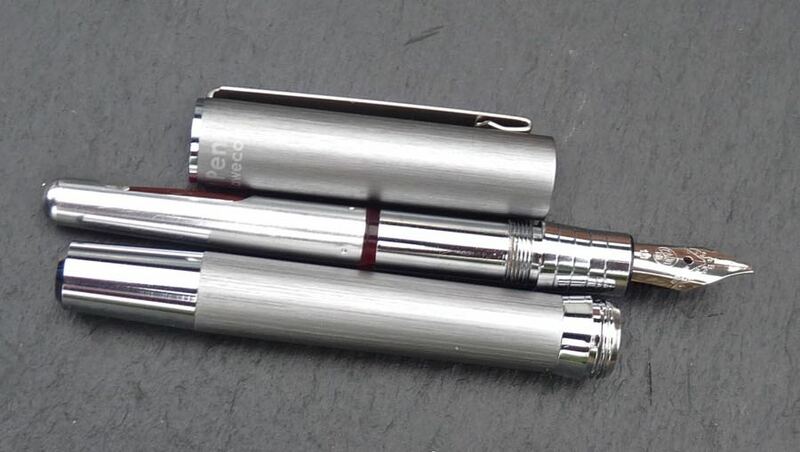 The cap screws closed, which is important for a pen you might be keeping in a pocket or bag. Every now and then I find the section unscrews along with the cap. You need to screw the section into the barrel very firmly to avoid this happening. The cap pushes on to post and is very secure when you do so. 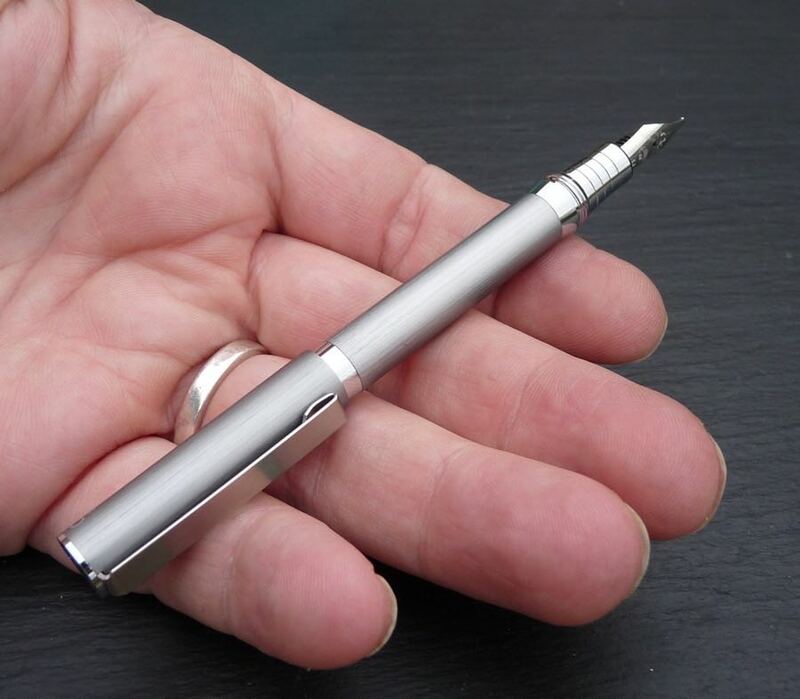 The Cult Pens Mini Fountain Pen is, indeed, very mini. Even posted, it’s small in the hand. The section is very short and so the threads and the flanged step from the section to the barrel work together to press into your fingers. It’s quite uncomfortable. This isn’t a pen you’d want to use to write your first novel. This pen is well put together but looks a little plain to my eyes. It has an excellent range of nibs, most of which are likely to be great. It’s a little too small to be overly practical for long use but that’s not always your first priority with a pocket pen.